Mama Kankasa was a true champion of feminism – Kazembe. Mama Chibesa Kankasa should be remembered as the woman to take the first ‘shot’ against patriarchy in Zambia. 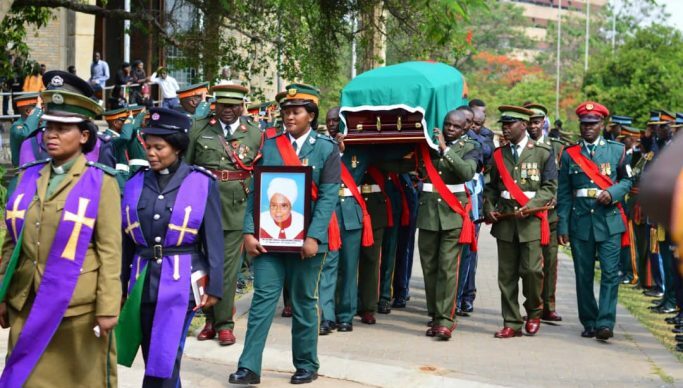 Speaking during the late freedom fighter’s funeral service at the Cathedral of the Holy Cross yesterday, gender activist, Brigadier General Fridah Kazembe said Mama Kankasa made a lot of strides on advancing issues of women in Zambia when she served as minister of Women’s Affairs between 1969 and 1988. She said Mama Kankasa was the pioneer of the introduction of maternity leave and mothers’ day in Zambia. “The late freedom fighter was cardinal in developing the current women’s affirmative action that is currently being enjoyed in Zambia today,” she said. Meanwhile, the Plan Parenthood Association of Zambia (PPAZ) National Chairman Michael Chimponda described Mama Kankasa as a pillar in family planning sensitization in the country since she became PPAZ patron in 1972. “At a time family planning sensitisation was a challenge in Zambia, we regarded you as a pillar and strong advocate of women’s rights in reproductive health,” he said. Chimponda said PPAZ would honour Mama Kankasa by naming their new boarding house after her.